The forests of California are plentiful, diverse and managed for many different objectives. A recently published book chapter, "Forestry" in the 2016 Ecosystems of California book, provides a detailed overview of the history and future directions of California's forests. Of the approximately 33 million acres of forest in California, federal agencies (including the USDA Forest Service and USDI Bureau of Land Management and National Park Service) own and manage 19 million acres (57%). State and local agencies including CalFire, local open space, park and water districts and land trusts own another 3%. 40% of California's forestland is owned by families, Native American tribes, or companies. Industrial timber companies own 5 million acres (14%). 9 million acres are owned by individuals with nearly 90% of these owners having less than 50 acres of forest land. California forests face a number of threats. The greatest threat is not loss of forest due to harvesting and the lack of subsequent regrowth but conversion to non-forests from serious catastrophic events such as large wildfires and land use conversion to agricultural and residential land uses. Indeed, the standing forest volume continues to increase on both private and public forest lands. However, we are witnessing a significant increase in the occurrence of large wildfires. As the economic value of forests as a source of woods products is decreasing due to high costs, low income, and woods products infrastructure loss it becomes harder for owners of forest properties to maintain economic sustainability. Softwood sawmill capacity in California shrank by 25% in the last few years alone, according to CalFire. At the same time, California’s forests are feeling the impacts of population growth. Urbanization, development and parcelization in rural areas are changing land use away from forests. CalFire’s 2010 assessment found that blue oak woodland to be the habitat type in California with the most acres at risk from development. One of the bioregions with the highest proportion of acres at risk included the Sierra Nevada montane –hardwood-conifer type. Forests on the west slope of the northern Sierra face heavy development pressure due to access to major urban highways (US 50 and Interstate 80). Priority areas where forested areas are at risk are shown the figure at right where red is high priority, orange is medium priority, and yellow is low priority. Managing California's forests to withstand the threats of conversion and population growth requires partnerships between forest land owners, agencies, research institutions and the public. A strategic goal of the University of California Division of Agriculture and Natural Resources is to help sustain the resilience of the forest ecosystems of California by working in partnership to provide research based information on forest ecosystems and growth, vegetation management, wildlife, plants, insects and disease, wildfire, streams, roads,climate and policies to help reduce these threats. We hope to help landowners improve their stewardship of forest lands and educate the public on management of public forests in California. See this webpage for an overview of major forest trees and types in California. This 2006 US Forest Service publication on the Family Forest Owners of the United States summarizes results from the National Woodland Owner Survey of the estimated 10 million family forest owners who collectively own 35% of the nation's forest lands. 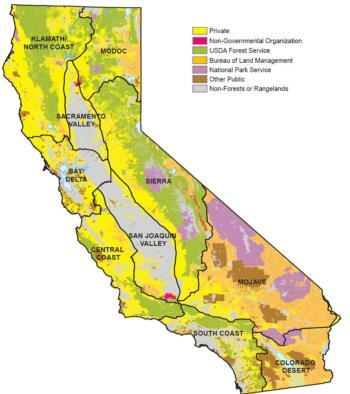 CalFire's 2010 Forest and Rangeland Assessment describes the treats and opportunities facing California's forest lands.